I make no secret of the fact that I have ZERO creativity when it comes to most things - particularly clothes! I stare a lot at women around me for inspiration and I also read blogs that appeal to my sense of style. I make no apologies for the fact that I steal a lot of looks and post them up on Avenue 57 as my own! But credit where credit is due, when I saw Joanna yesterday on Poppy's Style I thought to myself 'that's really nice and very well put together, I'll have that look for tomorrow'! 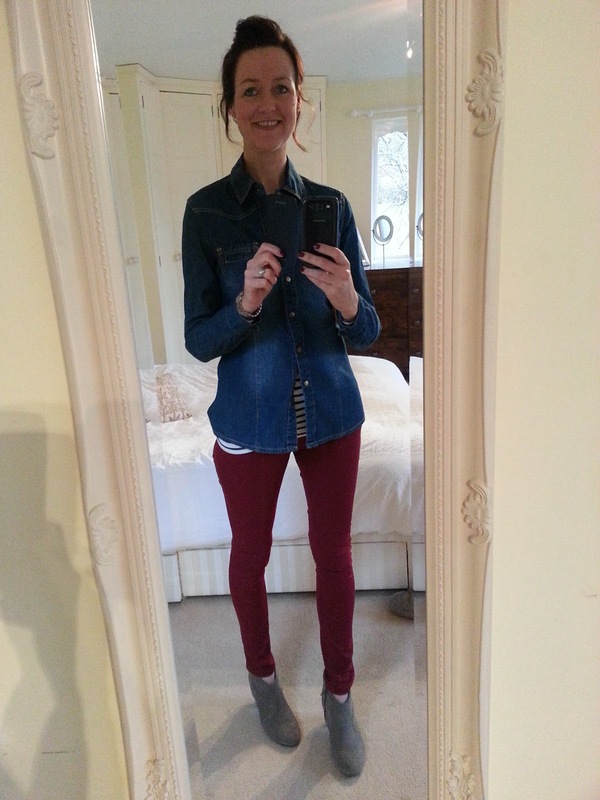 It was so easy to get up this morning KNOWING what I was going to wear - took 5 mins to get dressed (instead of usual 15 just stood in front of the wardrobe waiting for a top or dress to jump out at me .. then going to the jeans drawer to see if inspiration will leap from there and then finally onto the shoe cupboard to see if it's a style of shoe or boot that will bring together an outfit). I cannot tell you also how over the moon I was when H&M sent me a sale email the other week and my favourite tshirt in the whole wide world EVER was in the sale at £3.99 (it's not in the sale now but it's still ONLY £7.99) - I bought this striped one, a grey one and a white one - NEVER buy just one of your favourite items - always buy lots and lots. Remember I wrote a love letter to this favourite tshirt of mine last year? When I say I'm in love, I really do mean it!! There a lot of gorgeous women posting on A57 at the moment - I am truly one happy magpie right now! 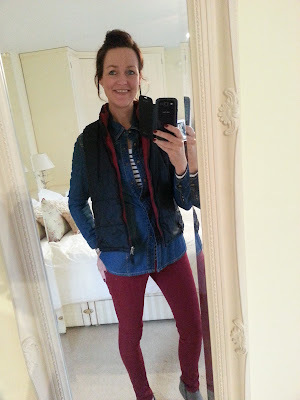 PS - this gilet is 15 years old and I still love it. What item do you have that you still love that is borderline vintage it's so old? Looks great Fiona! I have tons of clothes that could practically be called vintage. Off the top of my head I can think of a long grey cardigan (no idea of brand! ), a black & white Express jacket and a Liz Claiborne orange jacket .. all of which were bought when I first got married alomost 17 years ago. Then again, I have stuff that has gone to the charity shop within a few months! I want to see that orange jacket, sounds gorgeous. I'm not only missing the rock but also a willing photographer!!! Can't wait to see you in similar .. makes me think we should do another blogger challenge soon - one item styled a few ways by us all? 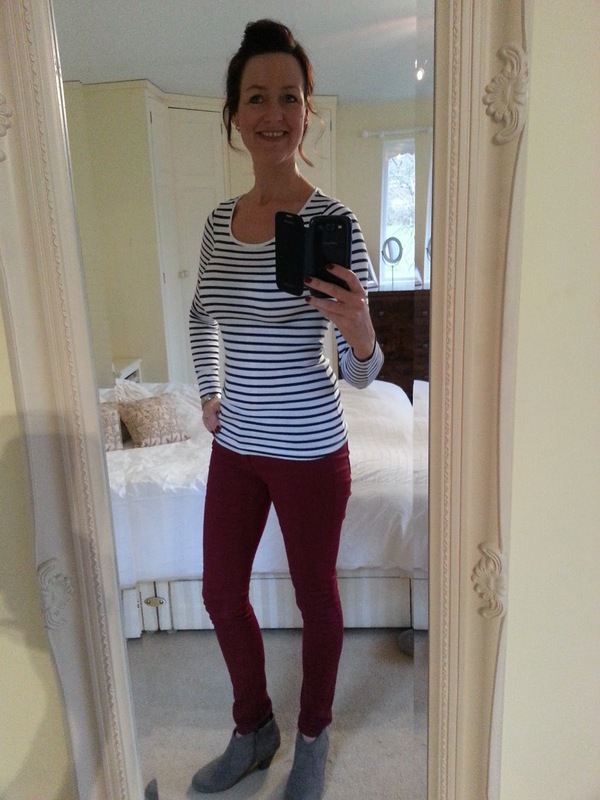 Looking great Fiona, love stripy t's and even better with bright jeans. The jeans are too tight - I need bigger ones!! I love this look on you and the slight rockabilly quiff is cool. I think the oldest thing in my closet is a 10 year old pair of red shoes from Hobbs - they look like something out of Wizard of Oz and instantly make everything I wear a bit retro. We could do an 'oldest thing in wardrobe' series! that's a great idea - perhaps a blogger challenge - how to style the oldest thing in your wardrobe? ?